Christmas Day and New Year is coming. Let end this year in cool way: go far and try new things. 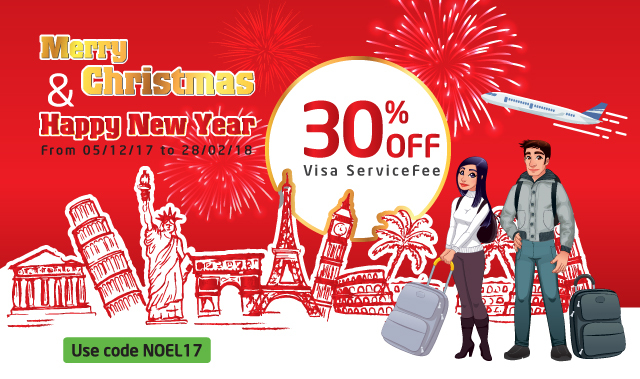 We understand that you need to pay for many stuffs, so there you are, the highest discount ever: 30% off for Visa service fee, from 5 Dec 2017 to 28 Feb 2018. Add promo code NOEL17. Or just click on below picture to reduce price directly. You can come back home, discover new places, or just simply relax and have great experiences. Many traditional celebrations are waiting for you to join in this winter. Get a visa, buy a ticket and follow your heart.